A little sprinkle of pixie dust, anyone? 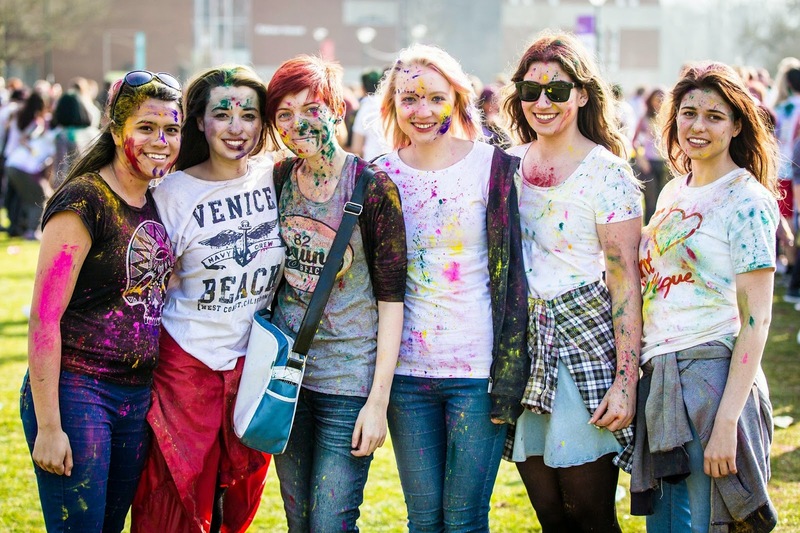 As part of One World Week at the University of Sussex, a lot of people took to throwing coloured paint powder at each other in the Hindu festival of Holi. 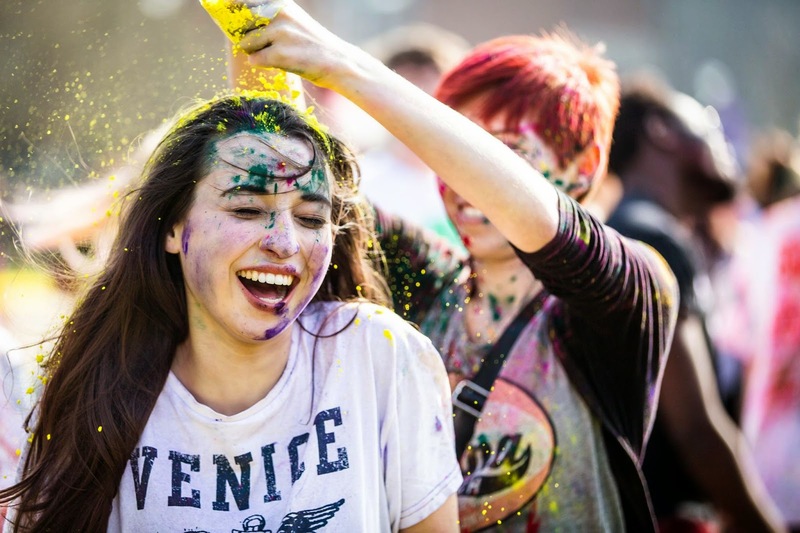 Not only does Holi mark the beginning of Spring, but also a day to forgive and forget, to rid oneself of past mistakes and a day to renew relationships. It's also a great deal of fun. All photography by the amazing Malcolm Tam - you can find his website here. We spent a few hours playing in the sun, throwing the colourful substances at each other and seeing who could get the dirtiest. I was sadly unable to take part in the festival last year, so was absolutely thrilled to get the opportunity! Everybody frolicked in the rainbow of flying colours, getting more and more multicoloured as the day went on. There ended up being so many people there that we began a giant conga line around the square (which ended up more like a game of snake, but there you go). May have nearly got blinded a couple of times but it was all in good fun! 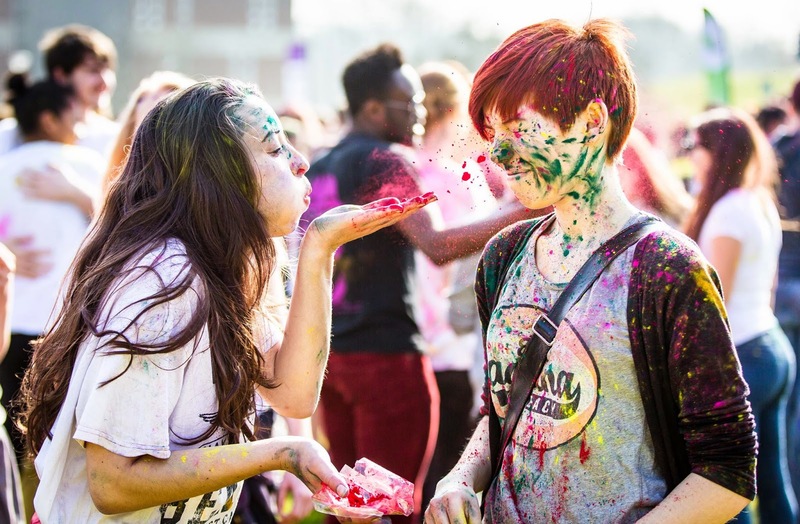 I've been really ill over the last week (hence the lack of posts) and even today I wasn't feeling my best, but getting up and spending the day in the sun at Holi really bought some life - and colour! - into the day. I'm so happy I went! I've been making more of an effort this year to step outside of my comfort zone and try more things; even things that I would usually avoid in favour of staying in, simply because I would be too afraid. It's really easy to take the easy route and miss out on life's little opportunities to have a beautiful day, and I can really say that saying 'yes' to things more often has made my year ten times better than the last. Obviously, this doesn't mean do things that you wouldn't want to do at all! But just stepping out of your comfort zone occasionally can lead to a new and wonderful daily adventure that will become an equally gorgeous memory. To top off the rainbow of festivities, the day concluded with one of the most magically colourful showers I've ever had. And if that's not worth it I don't know what is!